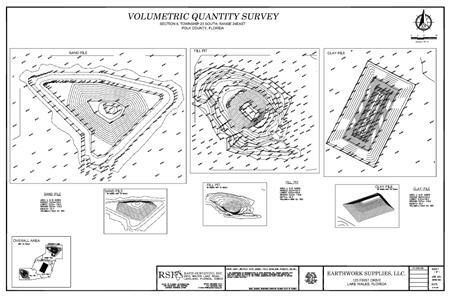 Quantity/Volumetric surveys are a type of Topographic survey performed for the purpose of obtaining measured quantities of stockpiled supplies or excavated quantities from a borrow pit. This type of survey will typically have the quantities calculated in cubic yards and are mainly used for excavations, stock piles, borrow pits, landfills, and pond volumes etc. Rapid Surveying will take field measurements and then produce a 3D model that will accurately calculate the cubic quantities of materials removed, filled or piled. For the final drawing or report, Rapid Surveying can provide 3D models or 2D maps of your survey data that will visually represent the shape of the site measured.